In 1959, Fidel Castro imposed a law forbidding the import of foreign cars, so many Cubans drive and maintain older models. I've always had a good time in Cuba. The people are friendly and funny, the rum is smooth, the music intoxicating and the beaches wide, white and soft. But you're accompanied everywhere by government minders. They call them responsables. Any Cuban you interview knows your microphone might as well run straight to their government. If you want to talk to someone with a different view, you have to slip out of your hotel in the middle of the night without your minder — though dissidents say other security people follow you. Each trip I've made as a reporter has revealed a little more of what kind of society Cubans live in. It's a warm, sunny place, filled with industrious and accomplished people who laugh loudly in public but mutter or whisper under their breath about the government. And the government is everywhere. In Cuba, the government is the news and the economy. It is the only voice in every broadcast or book. Every neighborhood has a local "Committee for the Defense of the Revolution," on watch for what they call "counter-revolutionary activities." You still sometimes make a human connection with your responsable, and each trip, I've left with a light suitcase. Responsables beg — that is not too strong a word — for you to leave them your blue jeans, razor blades, toothpaste, or The Economist magazine, which they cannot get and often try to sell. Government press people say, each trip, "Return as a tourist. Bring your family," and I've been tempted. Havana is beautiful, caught in a kind of pastel time capsule of a 1940's sea-breeze skyline and 1950's Chevies nosing noisily up the street. Havana would be something to see before new Hyatts, Starbucks, or Chase Bank buildings make it look like many other modern cities. But tourists inhabit a separate Havana. They can spend dollars, eat lobster, and drink wine in beachside restaurants in which Cubans are not permitted. They can watch news from around the world and travel the Internet as Cubans can't. And it is startling and sad to see legions of young women lined up behind tourist hotels, hoping, as Yoani Sanchez, the Cuban blogger, has written, to "snag ... a tourist to take them to a hotel and offer them, the next morning, a breakfast that comes with milk." The largest hotel company in Latin America is the Grupode Tirismo Gaviota. It is owned by the Cuban military. So while I've been glad to go to Cuba as a reporter, I can't bring myself to return as a tourist. Maybe now, more Americans will get the chance to see Cuba. And I hope they get to know what they're really seeing. I've always had a good time in Cuba. The people are friendly and funny, the rum is smooth, the music intoxicating and the beaches wide, white and soft, but you're accompanied everywhere by government minders. They call them responsables. Any Cuban you interview knows that your microphone might as well run straight to their government. If you want to talk to someone with a different view, you have to slip out of your hotel in the middle of the night without your minder - though dissidents say other security people follow you. Each trip I've made as a reporter has revealed a little more of what kind of society Cubans live in. It's a warm, sunny place filled with industrious and accomplished people who laugh loudly in public, but mutter a whisper under their breath about the government. And the government is everywhere. In Cuba, the government is the news and the economy. It is the only voice in every broadcaster book. Every neighborhood has a local Committee for the Defense of the Revolution on watch for what they call counterrevolutionary activities. You still sometimes make a human connection with your responsable and each trip I've left with a light suitcase. Responsables beg - that is not too strong a word - for you to leave them your blue jeans, razor blades, toothpaste or The Economist magazine, which they cannot get and often try to sell. Government press people say, each trip, return as a tourist, bring your family. And I've been tempted. 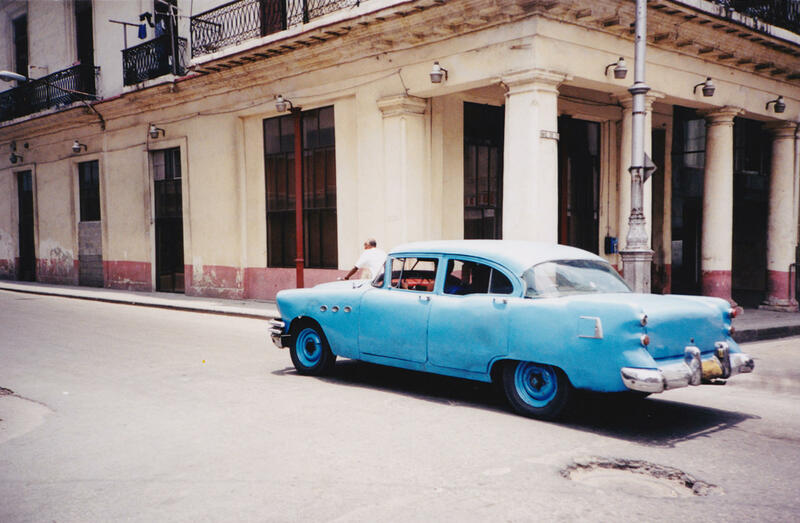 Havana is beautiful, caught in a kind of pastel time capsule of the 1940's sea-breeze skyline and 1950's Chevys nosing noisily up the street. Havana would be something to see before the new Hyatts, Starbucks or Chase Bank buildings make it look like many other modern cities, but tourists inhabit a separate Havana. They can spend dollars, eat lobster and drink wine in beachside restaurants in which Cubans are not permitted. They can watch news from around the world and travel the Internet as Cubans can't and it is startling and sad to see legions of young women lined up behind tourist hotels hoping, as Yoani Sanchez, the Cuban blogger has written, to snag a tourist to take them to a hotel and offer them, the next morning, a breakfast that comes with milk. The largest hotel company in Latin America is the Grupode Tirismo Gaviota. It is owned by the Cuban military. So while I've been glad to go to Cuba as a reporter, I can't bring myself to return as a tourist. Maybe now more Americans will get the chance to see Cuba and I hope they get to know what they're really seeing. Transcript provided by NPR, Copyright NPR.